Clinical depression is a state of intense sadness, melancholia or despair that has advanced to the point of being disruptive to an individual's social functioning and/or activities of daily living. Although a low mood or state of dejection that does not affect functioning is often colloquially referred to as depression, clinical depression is a clinical diagnosis and may be different from the everyday meaning of "being depressed." Many people identify the feeling of being clinically depressed as "feeling sad for no reason", or "having no motivation to do anything." A person suffering from depression may feel tired, sad, irritable, lazy, unmotivated, and apathetic. Clinical depression is generally acknowledged to be more serious than normal depressed feelings. It often leads to constant negative thinking and sometimes substance abuse. Extreme depression can culminate in its sufferers attempting or committing suicide. 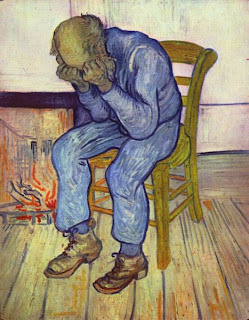 Clinical depression affects about 7% - 18% of the population on at least one occasion in their lives, before the age of 40. In some countries, such as Australia, one in four women and one in six men will suffer from depression. In Canada, major depression affects approximately 1.35 million people. The mean age of onset, from a number of studies, is in the late 20s. Because people who have one episode of depression may have more in the future, the first time a young person becomes depressed is important both as a personal and public health concern. Complete rip-off from Wikipedia's article on Depression. Theres more where that came from. Thanks Vincent van Gogh for the pic. May your soul rest in peace. Err, I just found this article interesting. Thats all.